I probably should wait till they are in hand so there won't be any surprise cost changes. PC Boards are somewhere in the mail, supposedly. Sounds good. I just received two dds-60's , and sustaining to gather the rest of the components. Thanks for the update. Awesome. I ordered two more DDS-60's that are in the mail also. I would be interested in one or two boards as well. I have good news, and not so good news. The good news is the boards have arrived, as you can see. The not so good news is I don't have time to check one out, and there are a fairly limited number of them. When I ordered them there were very few requests, but the number seems to be increasing rapidly, and delivery took longer than expected. One other piece of good news is that the earlier run of boards was tested by at least one person and found to work, and this run used the same Gerber files, but a different PCB vendor. So take that into consideration. I will order a larger run of boards as soon as we have further confirmation that these are good. Anyone wanting one of these boards can drop me an email and we'll handle it by PayPal. See the first posting for details. Last edited by w6akb on Tue Jul 29, 2014 1:52 pm, edited 1 time in total. 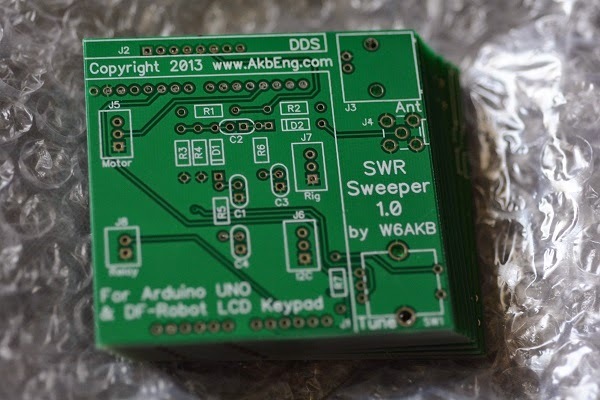 What are the values of cap C4 and resistor R7 on the Sweeper board? The rest are in the book and on the project website, but those two are not. Are they unused locations, or do they need to be populated? K0PER wrote: What are the values of cap C4 and resistor R7 on the Sweeper board? The rest are in the book and on the project website, but those two are not. Are they unused locations, or do they need to be populated? I have moved my response about these and other components on the PC board to the first posting of this thread rather than make them hard to find buried in the thread. Please refer there for these details. Allen would you post the boards to VK? We can send boards to VK. I updated the first posting with sales info to make it easier to find. I have a few boards left.